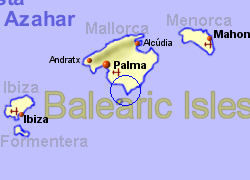 The peaceful development of Colonia de Sant Jordi lies just west of the southern most point of Mallorca, approximately 40Km south east of the capital, Palma city. Not a town in its own right (it is part of the municipality of Ses Salinas which lies approximately 7Km inland), this was originally a fishing and salt producing community. Salt is still extracted from the local salt beds which have been in use since Roman times, and celebrated by a fiesta in August. There is also still a fishing harbour and marina where boat trips are available. 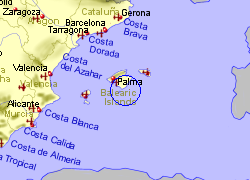 Map of the Colonia de Sant Jordi area.